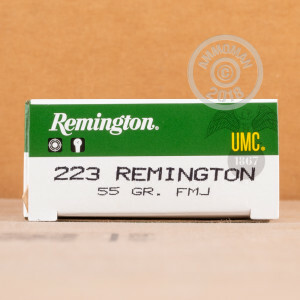 Where better to get your .223 Remington ammo than from Remington UMC? These inexpensive yet accurate cartridges are a target shooter's delight, delivering 3,240 feet per second of muzzle velocity and similar ballistics to M193 military ball ammo. Each cartridge fires a 55 grain full metal jacket ("metal case") bullet. This ammunition is manufactured in Arkansas using non-corrosive Boxer primers and brass cases. 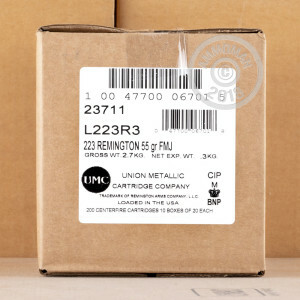 It comes packaged in a 200 round case (10 boxes of 20 rounds each) for bulk savings and convenience. 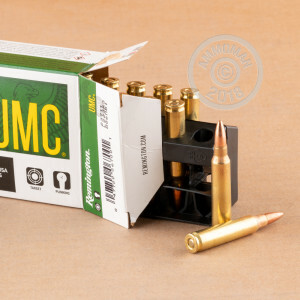 Grab your next batch of range ammo from AmmoMan.com and save big! All orders over $99 come with free shipping so you can shoot too much instead of spending too much! I use these for range use and get some pretty tight groups with them. For the price you can't go wrong. I have fired over 500 rounds without a single dud.